Of Note Stationers co-founder Isabel Bonenfant with some of her company’s cards. Like vinyl records and expensive bourbon, paper is making a comeback. OK, paper never really went away, but e-mail, then texts, then SnapChat made putting pen to paper a lost art. Until now. Retailers are seeing a surge in day-planner sales among young women. Design-obsessed denizens in Boston are flocking to “Sip and Script” calligraphy classes, where they can perfect their penmanship for envelopes and placecards. And, where the big dollars are, millennials are now buying more greeting cards than baby boomers, reports the industry’s trade association. “The demographic has really shifted,” said Sarah Turk, a stationery analyst at the research firm IBISWorld. “Instead of it being more of an older consumer that values paper, we’re seeing a lot of millennials also purchasing paper products. It’s practically a law of nature that children rediscover things their parents or grandparents have long discarded (hence the fedoras on hipster heads). While the trend of sharing thoughts with ink will not revive the fortunes of giant paper producers shredded by falling revenue, it has bolstered the spirits of folks who make a living with cards and stationery. Carlos Llanso, president of the Greeting Card Association, said that cards, in particular, are having a moment, perhaps because posting “Happy Birthday!” on friends’ or family members’ Facebook pages day after day can eventually feel impersonal. “The product itself is all about connecting people, and maybe that’s one of the reasons that we’re seeing this resurgence,” he said. A rise in discretionary spending has also made the idea of spending $7 or $8 for a card with luxe details like glitter, sound, or engraving seem less of an extravagance. The numbers add up: Americans of all ages shell out between $7 billion and $8 billion on greeting cards each year, an amount that has remained relatively steady over the past decade. 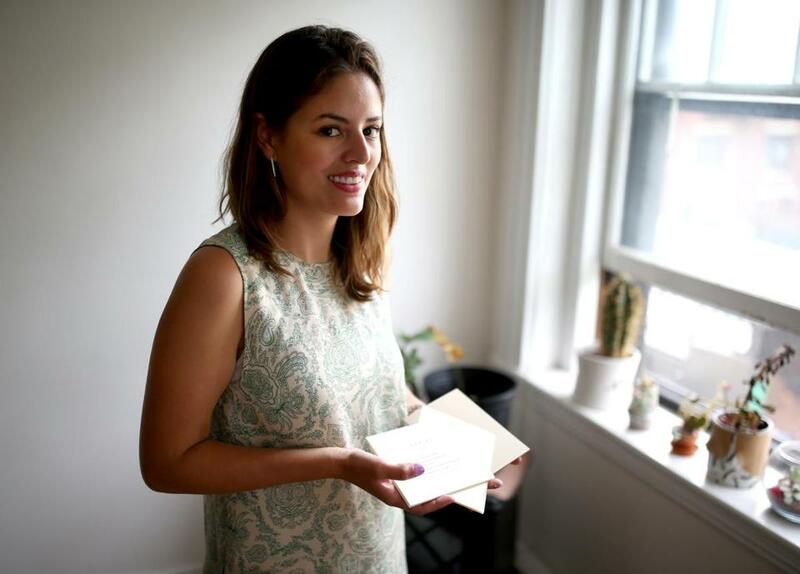 Kate Kellman and Isabel Bonenfant are the 28- and 26-year-old founders behind Of Note Stationers in Boston and self-described “paper people” who fit the demographic of younger, newfound paper devotees. The duo both had a habit of hoarding the beautiful greeting cards they collected in their travels. Before they started their company 2½ years ago, they spent a year dipping into their stash and mailing them out to their friends for the smallest of occasions. Then, being millennials, they documented all of their correspondence on Instagram. Isabel Bonenfant showed some of the cards she has at her Fenway apartment. The two now print their cards at Repeat Press, a shared letterpress facility in Somerville. And while it’s not yet paying their rent, they are selling their cards on Etsy, a website for handcrafted items, and for $5 each in the local gift shop Black Ink and home goods store West Elm. Kellman’s and Bonenfant’s model is an example of the shifting retail landscape for paper products. The closing of small stationery stores in the economic crash of 2008, coupled with the merger of major pharmacy brands, has meant distribution channels for the country’s biggest cardmakers, Hallmark and American Greetings, have shriveled up, said Patti Stracher, director of the National Stationery Show, which held its 70th anniversary event at the Javits Center in New York City last month. “The last place a millennial is going to shop is a Hallmark store; they just won’t,” Stracher said. “They’ll go to a pop-up shop, a street fair, or an independent store, where they have an experience and where they have choice of all kinds of subject matter.” She said Paper Source has been among the most successful retailers, in part because it curates its product lines by selecting stationery from local cardmakers. While personal sentiments used to be focus of cards, there has now been a bit of a cult of personality within the stationery designers themselves. The witticisms and wry observations of Emily McDowell’s empathy cards have garnered her over 75,000 Instagram followers. (A sample: “Together we can find a cure for the phrase, ‘What doesn’t kill you makes you stronger.’ ”) That following has helped her, and artists like her, hone their own brands and sell directly to consumers and independent retailers. Kate van Geldern, the Boston author of the DomestiKated Life blog, attended the National Stationery show and said some of the most popular brands, like the bright blooms of Rifle Paper Co. or the sophisticated gold-embossed line from Sugar Paper, were so crowded she could not elbow into the booths. “There’s almost a little bit of a fan culture,” she said, noting that people were posing for selfies with the products. Some even argue that our ever-more-digital existence is helping push the sale of paper goods. The rise of the “Pinterest bride” has overhauled stationery-buying process, said Katie Lacey, chief executive of Crane & Co., the Dalton-based stationer that has engraved correspondence for the likes of patriots Paul Revere and Tom Brady. Lacey said brides used to come into stores and look through books of invitations. Now they come in with a digital pinboard and know exactly what they want. “Now that there’s digital, paper becomes more special and more meaningful,” Lacey said. Card industry executives say the need for sharing sentiments is an innate human trait, and the most successful companies will be the ones that make the experience as personal as possible for all parties involved. 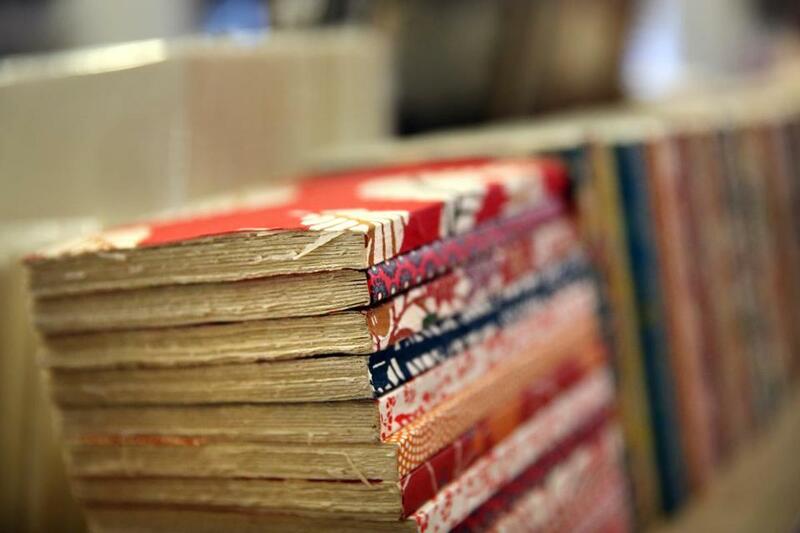 Newly opened Itoya Topdrawer on Newbury Street displays high-end Japanese notebooks.